Most of us are familiar with the basic techniques of candle magick, which entails choosing a color which matches our goal, marking the candle with words or symbols indicative of our wishes, anointing the candle with oil, employing herbs, charging the candle and finally releasing its energies. When casting candle spells, most of us have been taught to use tapers, household candles, and/ or glass encased candles. In my experience, most people use votive candles as offerings to deities, the ancestors, or other Higher Powered energies; the burning of votive candles can also accompany prayer as well. However, very little has been said or written about casting spells using votive candles or tea lights. They believe that the odd familiar size and shape of the candle is counter-productive to casting spells in the same manner that they are accustomed to. They may believe that because tea lights are small and do not burn as long as larger candles that they lack a certain degree of power. The thought may have not occurred to them. With a little modification, the magickal practitioner can translate traditional candle-magick techniques to the use of tea-lights. First of all, most tea lights come in white which is fine as white candles can be utilized for any purpose. Second gather together any herbs, oils, personal concerns, etc… that you would use for any other candle spell. Next, remove the tea light from the little tin cup that it comes in, and using a pin or needle carve your wish around the rim candle. I usually try to space out the letters so they go all the way around the candle and meet on the other side. Next, put a very tiny bit of your chosen herb(s) inside the bottom of the tin cup and add one to three drops of oil. Place the tea light back in the tin cup. Place some of your chosen oil on the tip of your finger. You will then place your finger on the top of the candle and run it around the wick three times. If you are drawing something towards yourself, move your finger clockwise; if you are moving something away from yourself, move your finger counter clockwise. 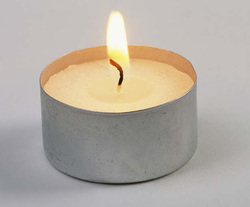 Finally, charge your candle by placing your hands a few inches over it and visualizing yourself inside a circle of light. Drawing energy from all around you, channel this energy into the candle while making your prayer or petition. Finally, light the candle and let the magick do its work.